Marvin Kemper has crafted a groundbreaking piece – a stunning, museum quality reproduction of an early 19th century longrifle in the style of the Bryan family of central Kentucky – that he has graciously donated for the Contemporary Longrifle Foundation 2013 fundraising auction. By the time of the War of 1812 the “Kentucky Rifle” and the frontiersmen who used it had already captured the imagination of the American public. When the War grew imminent, the danger and perhaps chance of adventure spurred young men who had grown up hearing and reading of the exploits of their elders to volunteer for the War in droves. Fringed hunting frocks, elegant top hats, long knives – and often a fine golden age “Kentucky Rifle” in hand. They marched off to face the old adversaries of their fathers’ times – British, Shawnee, Creek and others, often led by the very veterans they idolized as heroes; men like Isaac Shelby and William Whitley who had first crossed the Appalachians to the Kentucky wilderness 40 years earlier. What is not readily recognized is the role that early Kentucky gunmakers played in supplying arms to the men who served from the Thames to New Orleans and there is a misconception that “Kentucky rifles were not actually made in Kentucky.” However, by the time of the War of 1812 some of the most prominent, artistic and important schools of southern gunmaking were well established in what is now Kentucky and Tennessee. One of the most prominent early families of southern Trans-Appalachian gunmakers were the Bryans, working in and around Lexington Kentucky at the center of the “Central Kentucky” school of gunmaking. Relatives of the Boones, the Bryan family gunsmiths (William Sr., Daniel, William Turner and Lewis) built distinctive rifles in what we now recognize as the Lexington style in the late 18th and early 19th centuries. Like the men who carried them, the Lexington style rifle was an integral part of the close of the eastern frontier and indeed the expansion to the far western mountains. Having built longrifles in many more commonly known styles, Marvin decided to tackle the challenging yet rewarding task of interpreting and bringing attention to a style not well known and not often attempted by contemporary builders. Marvin’s experience restoring a fine William Turner Bryan rifle allowed him to study and absorb subtle details and features that make the difference to a discriminating eye. He consulted with Shelby Gallien, a noted researcher and collector of Kentucky-made rifles and author of the recently published book, Kentucky Rifles 1775-1900 and closely studied original central Kentucky rifles while planning and executing his build. 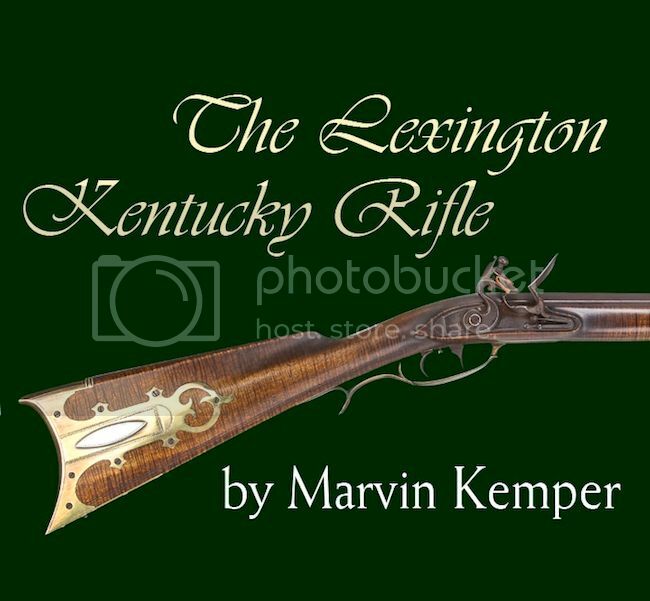 Marvin’s interpretation of a Lexington rifle, while not a bench copy of a single piece was built with exacting attention to detail in the style of a number of gunsmiths who worked in central Kentucky including William Graham and the Bryans. It has everything a Lexington rifle should have – and equally important – nothing that it should not – to be a museum-quality interpretation of an early 19th century Lexington rifle. Consistent with other great southern schools in this era, the decorative emphasis in Lexington was on crisp, bold architecture and subtle, finely designed and executed metal work, often set into superbly-figured maple stocks. To get the project “right” Marvin chose to donate and shape by hand the extremely fine curly maple stock from a blank. In order to accurately replicate the work of the Bryan shop, Marvin flawlessly fabricated a copy of an original Bryan triggerguard and other hardware. The triggers – one of the most distinctive features of a Lexington rifle – required manufacture from scratch. Marvin’s skill and attention to detail gives the final product the look of work done instinctively in the Lexington style – like one would expect from the hands of the Bryans themselves. The finely designed hand forged barrel keys with their decorative silver escutcheons, the signature Lexington style “captured lid” patchbox with its concealed hinge, and engraving perfectly executed in Bryan style are subtle details that indeed required many hours of extra work, but were required nonetheless for this rifle to truly represent the quality of work leaving the Bryan shop in the early 19th century. Marvin’s use of subtle aging replicates the look and feel of a treasured piece passed down through generations with the stories of the early frontier and the War. The end result is an extraordinary museum-quality and beautiful recreation. Marvin’s Lexington style rifle came from the mindset of a new school of contemporary building that takes its inspiration from the work of early gunmakers working west of the Appalachians – exploring uncharted territory and in doing so educating all of us along the way. The Kemper-Bryan rifle is cutting-edge work that I suspect will inspire many others to explore and work in this arena for many years to come. It really is a first of its kind – at least since the last of the Bryan gunsmiths quit working in the 1800s – and a stellar interpretation of the best work from one of the premier southern gunmaking schools of the late 18th and early 19th centuries. Kemper-Lexington Rifle Specifications: • Stock – super-fine curly sugar maple, donated by Marvin Kemper. 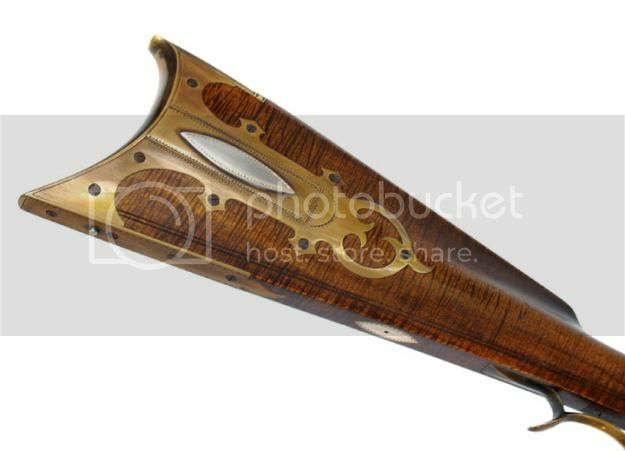 • Barrel – .45 caliber Rice barrel, 44 inches long (donated by Rice Muzzleloading Gun Barrels). • Lock – modified Late Ketland style made by Jim Chambers (donated by Mike Mills). • Hardware and silver – all made or modified, decorated and donated by Marvin Kemper.